Digital health businesses are changing the face of health care by delivering affordable life changing services at scale to people in need. One revolutionary business is Thrive, an evidence-based smartphone application providing in-depth tools and support for anyone to improve their mental wellbeing. Founded in 2012 by Dr. Andres Fonseca, Thrive has helped more than one million people and raised multiple rounds of capital from ClearlySo's extensive network of high-net-worth individual and institutional investors. Stephen Murdoch, human rights attorney turned impact investor and member of the ClearlySo Angels, serves as its chairman. 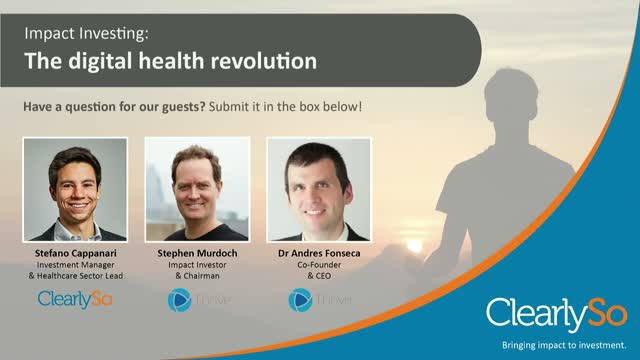 On this webinar, ClearlySo health sector lead Stefano Cappanari will highlight the latest trends in the sector and will interview Dr. Fonseca and Stephen to discuss what has made Thrive so successful, investors are looking for and the challenges businesses looking to raise capital face. With climate change concerns dominating the headlines, investor appetite for clean energy technology is soaring. Once considered risky and largely shunned by mainstream investors, it has now become a dominating force within the United Kingdom's rapidly growing technology startup scene. ClearlySo CMO John Lloyd interviews clean energy and environment sector expert and Investment Manager Matias Wibowo to find out why. - What are some of the innovative solutions helping to tackle the world's biggest environmental challenges? - Where is the investment going? What types of businesses? Many investors want to engage in impact investing and feel strongly about societal issues they want to try and solve. But most people don’t know where to start, what investment opportunities exist, and how to figure out what makes sense for them. To help listeners cut through the hype, we will offer some ideas about what funds and products are available, how to access them, some of the possible pitfalls and how to find an impact investment strategy that works. We will focus the discussion on impact funds in the context of trends for the impact sector as a whole. - Why does anybody invest in impact? - How to cut through the hype about impact investing? What can I actually do today that makes sense? - What are HNWIs, Family Offices, and Institutions investing in (investment themes, solving problems, asset classes, alignment)? - Why do people invest in impact funds? What are the trade-offs? What works and what doesn’t? What to look for in an Impact Fund? You’ll hopefully leave this webinar with a clearer view on how you can invest to solve the world’s biggest problems. Impact investing is one of the hottest areas in finance and growing at an estimated 17% annually in the UK alone according to research from Big Society Capital. But what are investors investing in? What types of businesses? What sectors are hot or not? ClearlySo CMO John Lloyd interviews impact investment expert and Head of Origination Simon Evill to find out. Insight from Europe's leading impact investment bank. ClearlySo is Europe’s leading impact investment bank, working exclusively with enterprises and funds delivering positive social, ethical, and/or environmental impact as well as financial return. Originally founded in 2008, ClearlySo has helped more than 130 clients raise more than £248 million in impact investment from its extensive network of high-net-worth individual and institutional investors.